I’ve lived in Eliot for 5 years now, and Martin Luther King, Junior Boulevard (MLK) is less than half a block from my house. If I had to use one word to describe it I would say ‘highway’ probably. The traffic is what defines MLK, slow and busy at rush hour, and fast and sparse throughout the rest of the day. However, perhaps those days are changing. With 4 projects under construction right now, MLK will become more of a residential street over the next year. From south to north, we have a 2-story 14-unit apartment building at the southwest corner of NE Morris and MLK. This project will not have parking, but is on a block with a surplus of parking currently and the site is so small that parking could probably fit into the plans. 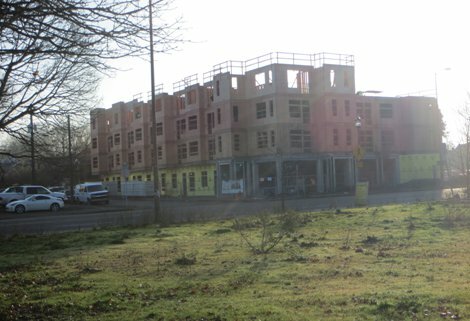 At the southwest corner of NE Monroe and MLK, ground is just breaking on a 5-story, 46 unit apartment building with 20 parking spaces. 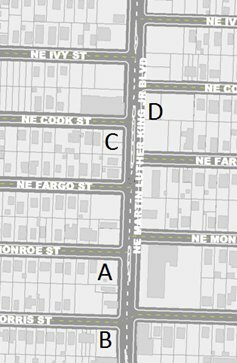 At NE Cook and MLK, a permit is filed for a near-clone of the Morris and MLK project: 2 stories, 14 units, no parking. On the other side of MLK, a 4-story partially subsidized project is going up. Dubbed the Eliot-MLK apartments, this project will take up the north half of the block between Fargo and Cook street. This is the only project on MLK with any retail space going in, it has the entire MLK street-frontage set aside for retail. This project has 50 units in it and a large amount of on-site parking behind the building. A potential second phase of the project would be on the south half of the block, but is just an idea at this point. In the next year, we can expect to see most of these projects finish, and there will be over 110 new units of housing and 200 new residents on MLK.